Hello! Thank you for stopping by on the Five & Dime blog tour today. I’m so thrilled to share a project I’ve been working on from this delightful fabric collection by Heidi Staples for Penny Rose Fabrics. 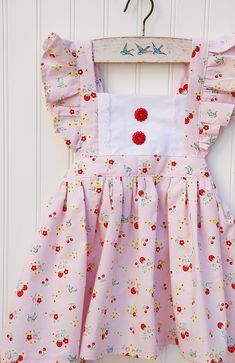 This fabric is truly adorable and there are so many sweet details to love in this range. If you happened to see my earlier post … then you know I am smitten with this line! Heidi created such a charming and original debut collection. The whole caboodle has me all heart eyes for days now. The darling illustrations in this collection tug at my fussy-cutting heart in a BIG way. I found myself daydreaming about how the illustrations reminded me of sweet little collectable patches. The light bulb went on and I decided to create something inspired by this idea for my stop on the blog tour today! What better to hold sweet patches than a t-shirt? I created a mini t-shirt quilt block to hold those sweet little “patches.” Heidi’s designs made this whole project extra fun to create. I just love the diamond pattern on the t-shirts. I thought it was perfect for this project to showcase the illustrations. That darling diamond print comes in 3 colorways – oh yassss! And did you see those teeny fuzzy slippers? Seriously cute! And the hairnet lady – she just makes my heart happy! Each t-shirt in my mini quilt has several different patches. Now I’m thinking I may need to make a real shirt version me! For this mini, I created 4 blocks pulled together with a gray solid and the sweetest binding from another of my favorite prints in this collection – a waitress order forms print (l-o-v-e this print!!). I couldn’t resist using up every little scrap of those illustrations and made a few tags. 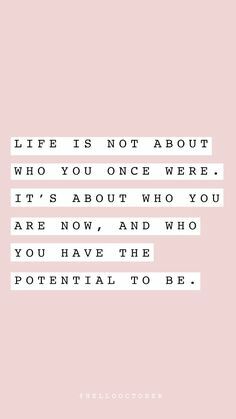 Thank you so much for joining me to share my inspiration from Five & Dime. It was such a joy to work with this collection. And I have so many more project I’d like to make with this line!! You will love these sweet fabrics! I can’t thank you enough, Elea! This is so darling!! Your mini is awesome! 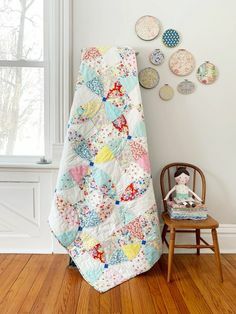 Love the fabric and the little projects you made with it! 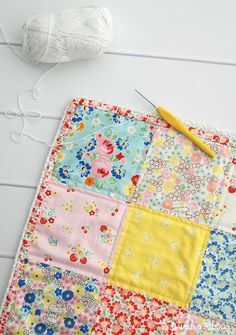 Love the fussy cuts on your mini quilt.